Last evening I went shopping to a popular Shopping Mall. It felt nothing less than a boxing ring. 2 hours of pushing through crowds, huge queues at the trial room and a stupendously long billing counter queue later I realized something. Nothing beats the beauty of a virtual world retail therapy. The comforts of sitting in your favorite couch at home, filtering out choices, browsing through many-a-stores and brands at the same time while sipping your cup of green tea…absolutely priceless. So in this post I have listed out 6 absolutely budget-friendly jewelry pieces from the virtual world. These are on my wish list for the upcoming festive season. 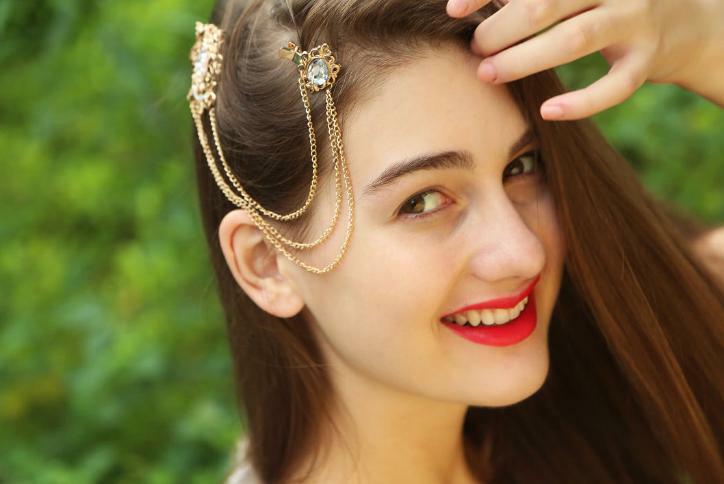 “Queen’s Own” Hair Accessory from Done By None, priced at 499INR. Blinging up your hair has been quite a trend for sometime now. 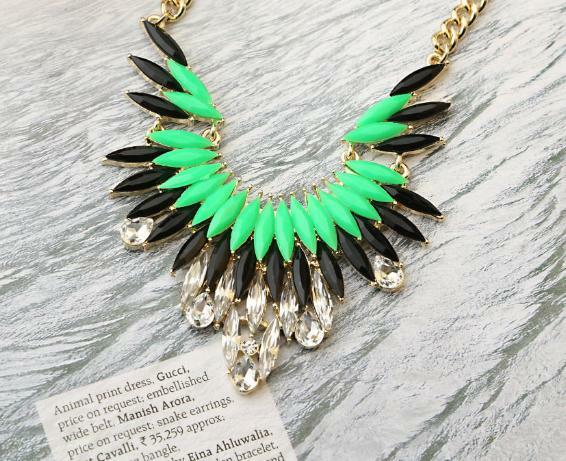 This piece of jewelry is great to add a lot of zing to your festive outfit. 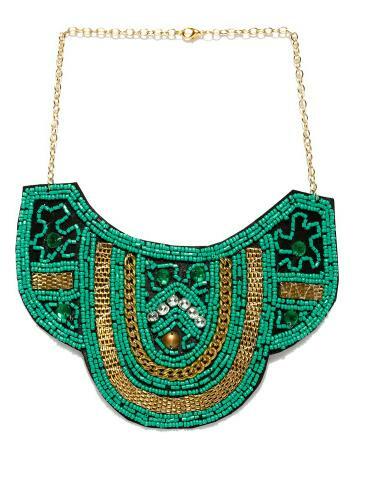 Adrika Green and Gold Toned Necklace from Myntra, priced at 350INR. Statement pieces have been and will continue to remain quite a rage. Make the piece a focal point of your outfit. Style the rest of your outfit around the focus. “The Star of Venus” necklace from Done By None, priced at 499INR. Style this piece with a collared shirt or tunic. Gold Cutout Floral Cuff from Faballey, priced at 450INR. No festival is complete with dashes of gold. Style it with a maxi dress or go simple with a bright colored shirt. 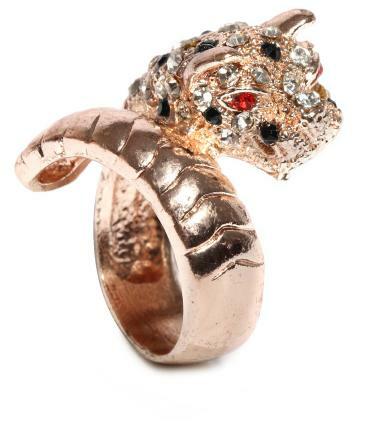 Dressberry Rose Gold Toned Ring from Myntra, priced at 299INR. And I am NOT kidding about the price. Cocktail Rings make quite a statement, especially when you want to go minimal. 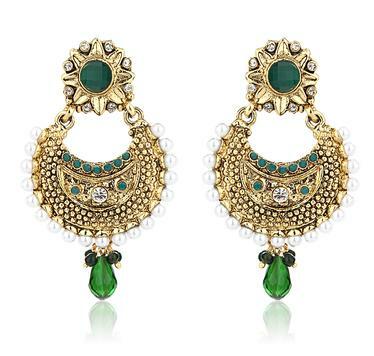 Sangria Green and Golden Danglers from Jabong, priced at 399INR. Go traditional by accessorizing this with a Sari, Salwar Suit or simply go fusion desi by teaming it with an Indianized Maxi skirt. So ladies, dressing up during the festive season need not be a hassle anymore neither should it burn a hole in your purse. Put on your desi best and kill it with your gorgeousness. Stay Stylish and Happy Shopping! First and last! Just wow!! and the price is unbelievable too! I could not believe it either!